Music for kids by singer songwriter Tony Funderburk. a demo of some of Tony’s fun music for kids. The very next song, “Stop Buggin’ Me” is another phrase I’m sure we’ve all heard some kid say…or maybe you’ve said it yourself. The fourth song, “Be Nice”, is also a phrase used by moms everywhere. It’s funny to watch kids. They can be the cutest, cuddliest, little bundles of love one minute…then you put them in a room together…and look out. “Green Monkey”, the fifth song in this collection of silly, fun music for kids, is all about a klutzy green monkey who enjoys everything green. It’s only natural…after all…greens are good for you, right? The sixth song is called “Keepin’ It Real”. Being a little kid in the care of our parents is the closest we ever come to being the center of the universe. Tony mentions that idea in this song. Of course, human frailties are always there “keepin’ it real”. For those of you who enjoy the seaside escapes “Island day” is the seventh song. It has a toucan, dolphin, swordfish, parrot, blue whale, and even an electric eel…all the creatures and none of the danger. OK…the eighth song is “Apple Doodles”. Yep…more doodles. For some silly reason kids have fun making messes. And this fun song is all about the messes…which you won’t have to clean up. And the tenth song is called “Timbuk Toys”. This is another retail toy store where Tony used to sell his fun and personalized music for kids. He liked the sound of the store name…how it sort of clicked off the tip of the tongue. Be sure and check out his background native singers. 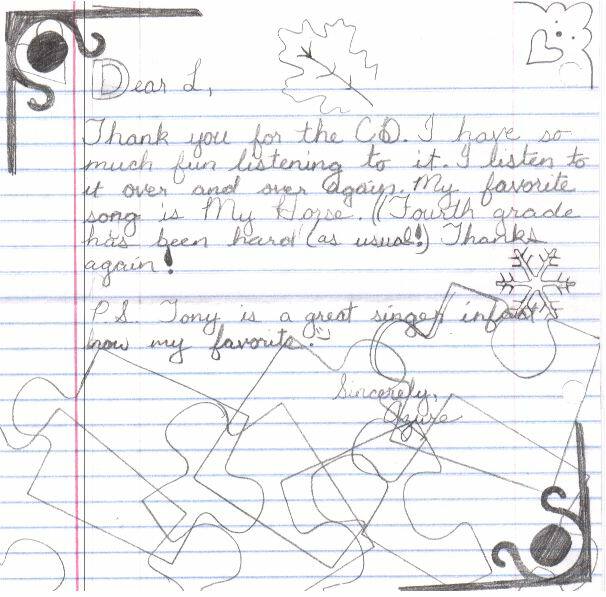 Order a CD of Tony’s fun personalized music for kids today. Order CD’s of personalized music for kids here. If the name you want is on the current names list, (click the drop down button) It’s only $12.00. This can be a different spelling of one of the names in the list…just not a completely new name. You can order unique or uncommon names not found on the list in the “New Kid In Town” form a little further below. 10 lullabies (and a little ditty) you won’t find anywhere else at any price. Play these softly near your child’s bed and watch the eyelids get heavy. These are some of Tony’s personal favorites. They’ll soon be yours and your kids’ favorites, too. You can actually hear the Lullabye Bye collection in the player above…for free. And when you like what you hear, just click the big yellow link in the player and download ’em today. No shipping…No waiting. And no extra charge. Zip, zilch, nada. Just $7 for 10 jazzy lullaby songs and get your pillow ready for sleepy time. Tony’s personal favorite kind of country music is actually cowboy music. You know…like Roy Rogers and his compadres sang around the campfire. So, he wrote and produced a collection of lullaby songs called “Bedtime Buckaroos“. You can hear samples in the music player above. Tell your kids Tony (and Roy Rogers) say goodnight…it’s bedtime, buckaroos. Hi, My son has an unusual name. Vivek. It is a very common name in India, where his dad is from, but we can never find anything here that is custom for him. What is the possibility of having a song done using his name? Tony, My name is Renee Strickland (Moe’s good friend). a CD for my grandson and it was a hit with the family. Thank you.